The accelerated ripening of coffee beans due to heavy rains left a red blanket in the mountainous zones of Granma province, where road repairs continue to reopen access to these areas. Residents of the surrounding communities are taking time off from their usual activities to pick beans before they fall and help bring in the harvest. 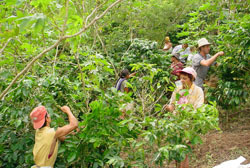 The first task after the deluge was to restore road access to coffee fields. More than 1,600 are taking part in road repairs, using picks and shovels to push back the soil that came down the hillsides during the rains. So far, nearly 30 kilometers of roads have been restored, in what is a colossal effort since 46 percent of roads in the area are damaged, more acutely in the higher elevations. According to William Chavez, in charge of coffee production and forestry for the Ministry of Agriculture in Granma, this weeks production was clearly on the rise. Chavez noted that 40 of the areas 51 pulping plants are back operating as well as the drying process using guardeola furnaces. Next week the harvests will receive reinforcements with students from several neighboring municipalities, said Chavez.